Product prices and availability are accurate as of 2019-04-08 14:49:52 EDT and are subject to change. Any price and availability information displayed on http://www.amazon.com/ at the time of purchase will apply to the purchase of this product. The Makita 12-1/4-Inch Planer, model KP312, is precision engineered for an even cut, every time. It is ideal for professional timber framers, carpenters, log home manufacturers, boat fabricators, and more. 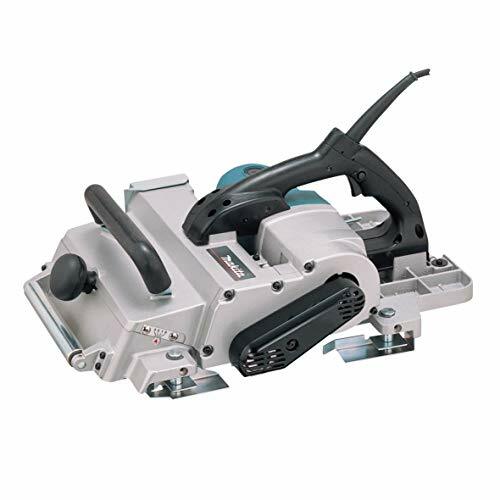 The KP312 features a 15 AMP motor that delivers 12,000 RPM for the most demanding jobs. The KP312 can plane up to 12-1/4 inches wide and 1/8-inch deep in a single pass. The non-slip long life poly "V" belt is designed to efficiently transfer power to the double-edged high-speed steel blades for consistent results. 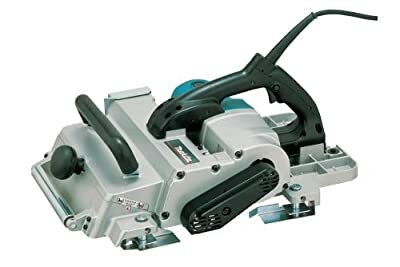 The front roller is engineered for easy moving of the planer over rough materials, and the large ejection chute provides a high rate of discharge and helps prevent clogging from wet or dry wood chips. The spring-loaded stand elevates the base to protect the blades and workpiece, and the ball bearing construction is engineered for longer tool life. The KP312 has several ease-of-use features, including a large, conveniently located depth setting knob for easy adjustment, and a guide rule for accurate and maximum use of planning width. The 33-foot cord is located at the top of the handle to help prevent obstruction during long and repeated passes. The rubberized front handle is designed for comfort, control, and reduced operator fatigue. 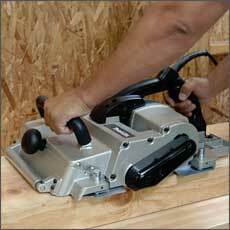 The KP312 is engineered for professional timber framers, carpenters, log home manufacturers, boat fabricators and general contractors seeking a best-in-class 12-1/4-Inch Planer. The KP312 is just another example of Makita's commitment to innovative technology and best-in-class engineering. Makita KP312 12-1/4-Inch Planer, wrench, triangular rule and blade set. 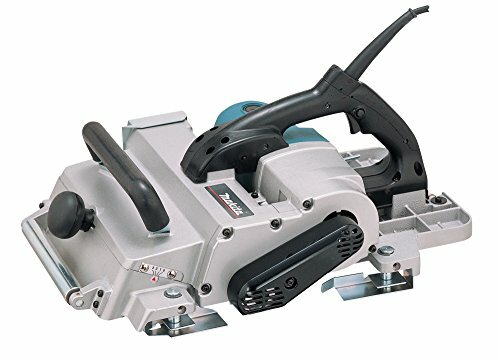 Powerful 15.0 AMP motor with 12,000 RPM for the most demanding applications Poly ""V"" belt designed with grooves efficiently transfers power from the motor to the blades Front roller for easy moving over rough materials Large ejection chute provides high rate of chip discharge and helps prevent clogging from wet or dry wood chips Ideal cord location and length (33 ft.) helps prevent obstruction during long and repeated passes Rubberized front handle for comfort, control, and reduced operator fatigue Large, conveniently located depth setting knob for easy adjustment Spring-loaded stand elevates the base to protect the blades and workpiece Guide rule for accurate and maximum use of planing width Externally accessible brushes for greater serviceability All-ball bearing construction for longer tool life Wrench (782209-3) Triangular Rule (762001-3) Blade Set (B-02870) KP0800K KP0810 1002BA 1806B 1912B Powerful 15 amp motor with 12,000 RPM for the most demanding jobs. Front roller for easy moving of planer over rough materials. Large ejection chute provides high rate of chip discharge and helps prevent clogging from wet or dry wood chips. Large, conveniently located depth setting knob for easy adjustment. 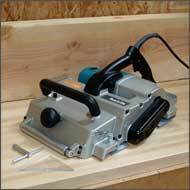 Equipped with built-in edge guides as well as a special "foot" located at the rear of base to protect planer blades.